Antares Energy received a $300m offer. 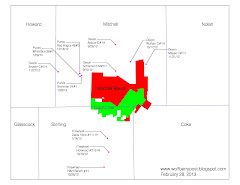 They have 4,697 net Wolfberry acres producing 1,204 boe/d from 48 wells at their Southern Star producing acreage. Also 11,984 net acres producing 146 boe/d at Northern Star and 11,000 net undeveloped acres at Big Star.